"The shore end of the [Mackay-Bennett] cable was taken up here on the 18th of October. The entire work remains under the control of Messrs. Siemen Brothers & Co., the London firm of manufacturers for thirty days, during which time it is undergoing a series of thorough tests under the direction of Messrs. Graham and Robinson, electricians of the establishment. Our illustration gives a view of the operating-room, which contains a number of very valuable and interesting instruments. 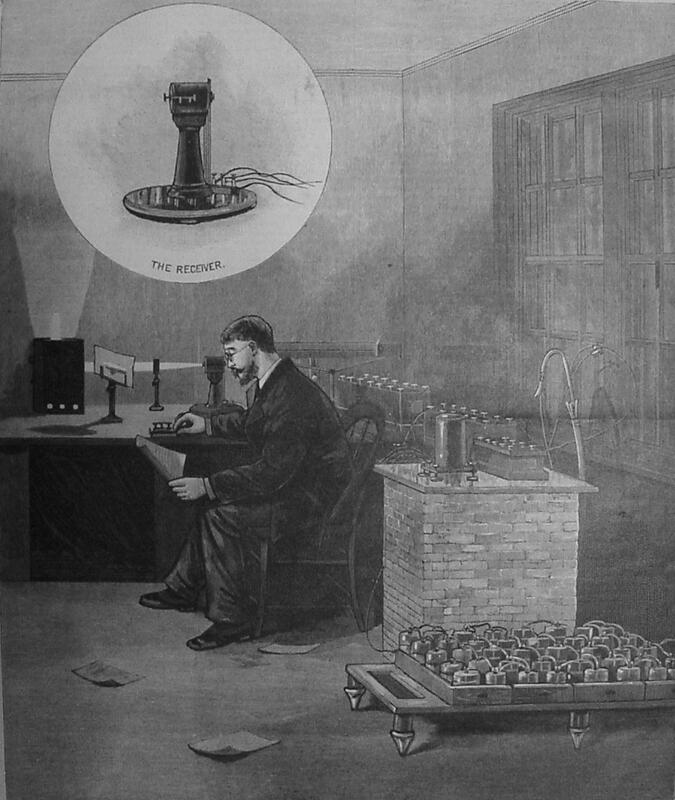 The chief of these is Thompson's reflecting galvanometer, by means of which the messages are received. This wonderfully sensitive instrument stands upon a solid column of brick, the foundations of which are laid deep below the sand. It consists of a tiny mirror with a magnetic needle across its back, suspended by a silken thread in the midst of a small circular coil of insulated wires. A current transmitted through the cable and the coil deflects the needle and slightly agitates the mirror, which throws a little flash of reflected light from a lamp upon a piece of white paper. A positive current flashes the beam in one direction, a negative current in the opposite. These right and left motions and pauses represent the "dots" and "dashes," by means of which the messages are spelled out. This instrument will be superseded by Sir William Thompson's siphon recorder when the cables shall be in proper condition for work. A second instrument used in testing the cable for breaks, consists of a large galvanometer attached to the outer wire wrapping of the cable, and also to a coil of fine wire, over three thousand miles long, at the station. By experiments upon the latter wire, a scale of galvanic force as related to distance is recorded, so that when a break occurs in the cable, an application of this scale to the galvanometer enables the operator to ascertain, within a very few miles, the location of the fracture."